Jamestown, founded in 1607 by colonists from England, is considered the first permanent British Colony. As the colonists endeavored to be self-sufficient, they certainly did become a colony of “makers.” They had to. But, how much “fine art” would have been going on in Jamestown and other early British Colonies, c. 1607 – 1675. The answer is, not much. The world would have to wait nearly 150 years before the colonists produced homegrown artists, and developed a true American style. Whether in Jamestown, or in any other struggling new colony, the activity most closely resembling “fine art” was the work of the craftsmen. In the 17th century, a journey back to Britain would take at least 30 days. Colonists trying to survive, and be productive, would certainly not have the resources to pay for frequent trips back and forth. Manufactured goods were imported from Britain, conveying news, and bits of culture, but until the colonists produced something in exchange, luxury manufactured goods, fashionable high end wares, and fine art, would have been out of reach. The early colonists would have been very isolated from the thriving art world in Europe. Besides, all hands must be put to work building homes and barns, farming, forging metal, carving wood, weaving, cutting, collecting, etc. And, with so much time consuming work to be done, everyone would have to contribute and be a part of the labor force. There would be no time or resources to perfect a painting style. 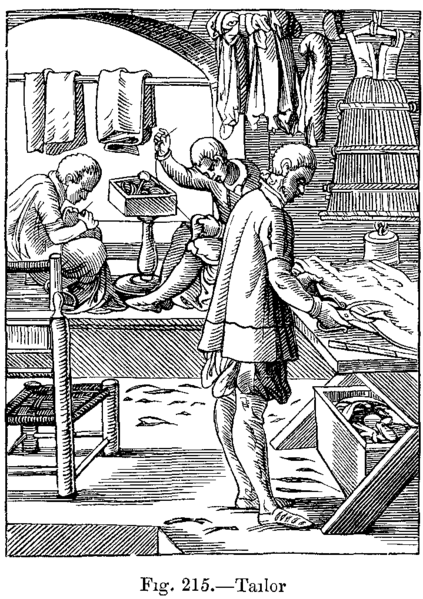 A Tailor at Work. When settlers in new British colonies needed something, they would have to make it within the colony, or make do without. There were many Colonial trades: coopers, apothecaries, joiners, wheelwrights, silversmiths, tailors, and blacksmiths, to name a few, in which craftsmen and women produced innumerable objects. So, there was certainly a lot of “making” going on, but the objects were of a practical nature. To examine images and short descriptions of various items of everyday life, and to learn how these items were made, we referred to Edwin Tunis’s book, Colonial Living. In Colonial Living, we specifically read pp. 21-22, pp. 29-31, pp. 43-45, p. 50, and pp. 67-69. Another nice series of books is called Colonial Craftsmen by Leonard Everett Fisher. Each book in this series focuses on a single trade or craft, such as glassblowers, or cabinetmakers, etc. But, right at your fingertips, a website describing many trades or crafts is found at the Colonial Williamsburg website. The series of pages at history.org can be found by clicking on the History tab, and then scrolling down to “trades.” All trades included in the Modern History Portfolio Junior activity are described on this website. Here is the direct link. 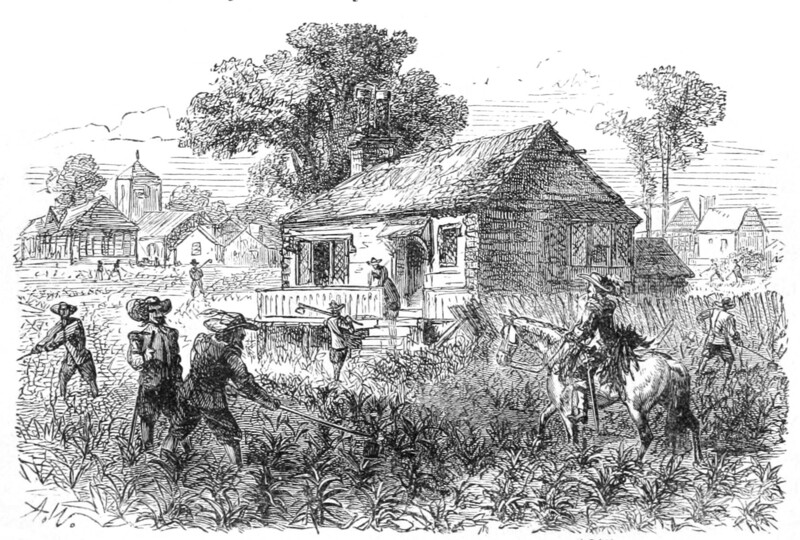 Simply becoming self-sufficient, however, was not the only requirement of the colonists. They would have to become producers, by growing crops, fishing, trapping, or harvesting natural resources. Remember John Rolfe and his plan to grow tobacco? The early colonists were under great pressure to produce exports for trade with Britain, and to help enrich the British Empire. Prior to 1675, the colonists were too isolated, busy surviving, developing a livelihood, and acquiring wealth for themselves and the British Crown to have time to develop an art making tradition and produce home grown American artists. Later, around 1675, when a painting tradition did develop, it was in the form of very practical portraiture, painted by who we now call limners. These limners were itinerant, or travelling, painters, rarely signing their work, and painting in an outdated style by European standards. By 1775, travel back and forth between the colonies and Europe was more common, allowing artists to be trained in Europe. And, by that time, enough wealth was amassed to pay for expensive works of art. Talented colonists, who had moved beyond the more elemental and all-consuming quest for survival, could finally take time out for fine art. Nearly 150 years after the founding of Jamestown, with the work of Benjamin West, John Singleton Copley, Gilbert Stuart, Thomas Sully, and Charles Wilson Peale, did the colonists arrive at a true American painting tradition. Check out my Pinterest board “Mod1-Colonization” for images of the trades included in the Modern Junior, plus lots more. Follow Homeschool Journey’s board Mod1 – Colonization on Pinterest. Hi there!We’re working on a 13 Colonies book and in serach of maps I found your blog. Thanks for sharing your ideas! Is there a way to enlarge the wheels? I’d like to do a larger version of the same thing.